Description BIG BIG WOLF always wants to eat lovely goats. This time he intends to take a hot air balloon to sneak into the goat village. Lazy goat is on guard and discovered the wolf, so he also take a hot air balloon to shoot down wolf's balloon. 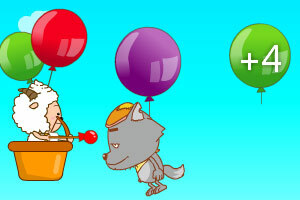 Try your best to shot wolf's balloon and earn score bonus; "?" balloon may be bonus or punishment; avoid the darts of the wolf and take care not to hurt the little wolf. Controls SW or ARROW KEYS to control the movement, J or 1 to shoot.